I just found out that Terminal services manager does not exist in Windows 7. 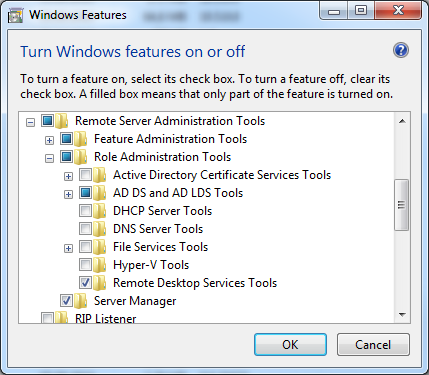 But fear not, the Remote Desktop Services Manager will do the trick. It is included in the Remote Server Administration Tools for Windows 7, which can be downloaded from here. 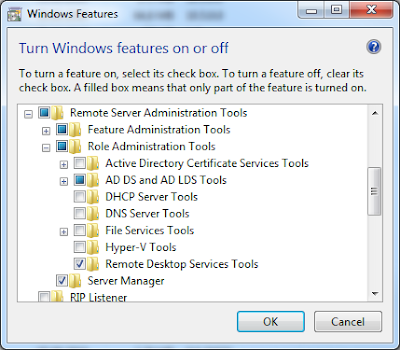 Go to "Remote Server Administation Tools", "Role Administration Tools", and enable "Remote Desktop Services Tools". Do you need to install the whole thing (240mb or so), or is there a smaller installer just for this that you can find in the download? I don't know if there might be a smaller installer embedded in the downlaod, but I would recommend installing the whole thing to ensure that you don't break break any updates from Microsoft. I tried looking anyway and didn't find anything obvious, so installed the wholething. Thanks for your guide. Thanks for this! If the progrma doesn't appear in the start menu after intalling the package, just type "remote" in the search box, and it will show up in there. Excellent tip! Just what I was looking for - thank you! This does show up but I am unable to do a "Run as" option to open the exe. I dont want to have to log off everytime I wasnt to run this. Any ideas why this is not available? I take this back. I just realised that you need to open RDCM and then add the server name. then on left hand side you right click and choose Connect As. Very useful..
Hrmmm, not available as searchable item or in admin tools. Could be because I am logged in remotely?? Weird..and MSannoying. Thanks, was grateful to find this post. it says this is only for win 2008 r2. unfortunately we still have servers that are 2003. Is there any way for this to work with that or is there another option? works great for my win server 2003r2. Thank you!!!! Does anyone know how to do this with Windows 7? This article describes the process for Windows 7. If you don't want to install this just to kill RD sessions then you can do it from a command line. Look for a connection with a 'STATE' of 'Active' - it will have a numeric ID. Where 'X' is the numeric ID you chose to terminate. I still can't get the terminal services manager to load so tried this. It worked like a charm!! Thanks!! There are many different versions of Windows 7. After installing window your step is create a password. So, you can visit Secure Random Password Generator. In this article you can find a strong password and also can get tips about latest window. tweak box is Associate in Nursing outsider application installer for iOS gadgets that let tweakbox ios shoppers transfer Cydia and alternative astonishing outsider applications for nothing which too while not Jailbreaking their gadgets.